Outdoor Pursuits - Hope Community Resources, Inc.
For over 20 years, Hope Community Resources’ Outdoor Pursuits program has ensured that all Alaskans have the opportunity to enjoy and partake in outdoor activities. We now have over 200 program participants across our state and that number continues to grow. Hope offers Outdoor Pursuits programs in Anchorage, Dillingham, Kenai, and Kodiak. 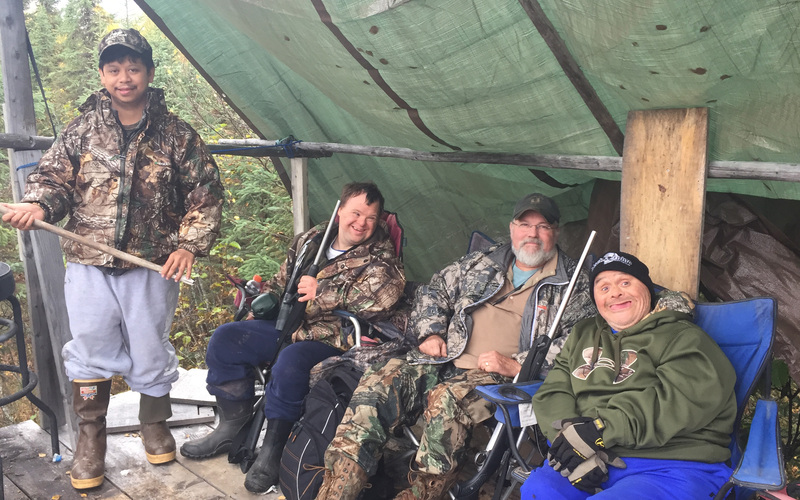 Trained staff provides supports for people to hunt, boat, fish, trap, kayak, snow machine, camp, boat, berry and plant pick and hike throughout Alaska. We also have a ranch in Willow, Alaska that sits on 70-acres with an infrastructure that supports hunting, fishing, trapping, animal husbandry, gardening, wood-working, mechanics, raising and selling livestock, and many other aspects associated with living off the land in a rural environment. A big component of our Outdoor Pursuits program is the focus in many areas on subsistence and cultural pursuits. These services are designed around individual needs and desires with a focus aimed at offering traditional subsistence activities characterized by hunting, gathering, fishing, trapping, and sharing, as well as in creating traditional arts and crafts. This focus is implemented through the use of specially adapted and accessible boats, snow machines and all-terrain vehicles. In the more remote regions of Alaska, our subsistence activities have enabled individuals to meet about 90% of their need for fish, game meat and berries. It also allows for individuals to gain socially valued roles in their community by providing for elders, bringing supplies to their family, and sharing with their friends. Countless lives have been changed by Hope’s Outdoor Pursuits program.